In February 2007, one of Israel's renowned major generals had been invited to play a new simulation game of the Israeli-Palestinian conflict on prime time Israeli TV. It seemed like a good idea at the time, as he was running for prime minister on behalf of the Labor Party. After being confronted with a suicide bomb in the opening sequence of the game, he responded with a series of hawkish moves, including an Apache helicopter airstrike and a ground operation to destroy the militants' infrastructure. Not long after, a pop-up informed him that his actions as the Israeli PM initiated the Third Intifada, or Palestinian uprising. He lost the game. "Is this game realistic?" probed the reporter. "There is nothing to learn from this game about reality," replied the major general with confidence, "as I took all the right actions." PeaceMaker was the first impact game that I was involved with. Over three years, together with game developers Eric Brown and Tim Sweeney and a group of Carnegie Mellon University students, we created what The Guardian called "an astonishingly sophisticated simulation" and what became a poster child for the burgeoning movement of so-called serious games. In the days when PC and console games were widely blamed for violence or shallowness, PeaceMaker took on one of the most complex challenges of our time, and did so with real-world footage, and in three languages: English, Arabic and Hebrew. PeaceMaker is a turn-based computer strategy game in which players can choose to play either the leader of Israel or the Palestinian Authority. They have to deal with real-world events and other stakeholders by taking political, social and military decisions. Their goal is to solve the conflict during their term in office. Published in 2007, the game is now available for free (for Windows or Mac). It was also an eye-opening personal journey. After living in Israel for 33 years and serving five years (rather than the mandatory three) as a captain in the intelligence corps, it was the first time I deeply engaged with Palestinians. Quite a few collaborated with us on the project, including a granddaughter of Mahmoud Abbas, the Palestine Liberation Organization's chairman. I saw Palestine and the Palestinian perspective like never before. It informed our game design, and it forever changed the way I view the conflict. In these days of great pain and despair in Gaza and Israel, Kotaku editor-in-chief Stephen Totilo asked me to go back and reflect on our design process. Could I share some of our assumptions? Did we learn anything in the design process about the potential solution and roadmap to peace? It's not easy to take a bird's-eye view when rockets and shells are flying, I replied. It's not easy when I'm sitting in New York City, and my family and friends are at war. He convinced me that this "could do some good and open minds." Ok, I said, I'll give it a shot. To create a plausible simulation of the Israeli-Palestinian conflict, we started with designing its logic. We assumed it's a coherent system with rational actors and cause-and-effect relations, with only a small margin for error and random events. Based on the news cycles, which often lack context, it's easy to frame the tragic events as "chaotic." It's easy to label local leaders as "crazy" or "irrational." We strongly disagreed with this oversimplification. Global conflicts are driven by leaders and political groups who have clear agendas and an endgame in mind. Just as in the current political climate, these groups' interests are at odds and trust levels are low. In that sense, PeaceMaker is different than most games. It is most difficult at its dawn, and gets easier and easier as you untangle its complexity. There is nothing more challenging than expressing empathy for the other side, especially when your side is under attack. It's common to mix conceptions of leaders with their country's innocent civilians and paint a black-and-white world: supporters of "our troops" and those who endanger our unity and conviction by opposing them. PeaceMaker introduced a different model: two games in one. Play as the Israeli prime minister or the Palestinian president and experience both perspectives, no matter what is your real-world background. It also presents asymmetric gameplay, as Israel has much greater control and resources. In PeaceMaker, walking in another man's shoes is not only a concept; it's the heart of the simulation. During our design process, many asked what was our solution to the conflict. A common misconception was that there is some elusive plan that the global community hadn't found yet or hadn't been creative enough and was therefore still searching. 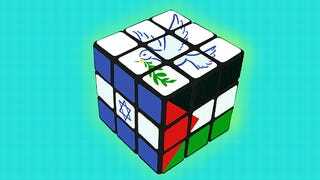 Our game assumed that the solution exists and is fully understood: two independent states—Israel and Palestine—living in peace next to each other. Drawing on terms agreed upon by the Americans, Europeans, UN resolutions and the Arab League, we adapted the same road map. The challenge in PeaceMaker, as well as in reality, is the twisted road to get there. It can't be done in one act. The situation on the ground is so complex, that small steps are needed in order to build trust, to ensure security and freedom, and to get the necessary buy-in from both populations. Unfortunately, that slow process plays to the hands of the extremists. After the initial shock, they would re-organize and do all they could to derail the process and discredit the leaders. Only the strongest leaders can take this to the end, paying an incredible personal price. Egyptian President Anwar Sadat paid with his life for signing the agreement between Israel and Egypt. Israeli Prime Minister Yitzhak Rabin was assassinated before reaching a final agreement with the Palestinians. What has changed since we launched PeaceMaker? First and foremost, we may be running out of time. Israel's insistence on building settlements in the West Bank, and the events of the last two decades indicate that the window for the two-state solution may be closing and we are reaching a dangerous point of no return. The alternatives, such as the one-state solution, has growing acceptance in the Arab world, but almost no support on the Israeli side. I recently read that over 60% of the young generation of Hamas militants in Gaza never met an Israeli civilian in their life. This is in sharp contrast to their predecessors, who worked with Israelis in safer times and could speak Hebrew. On the positive side, Israel is surrounded by five Arab nations: Egypt, Jordan, Syria, Lebanon and Palestine, a nation to be. It has signed a lasting peace agreement with two of the five: Egypt and Jordan. Those treaties held up through major changes in leadership and continuing challenges. Syria, a third country, kept a relatively solid ceasefire with Israel for 30 years. This doesn't only prove that peace is possible, it also demonstrates its benefits. With that perspective in mind, we're more than halfway through. Perhaps the most important aspect of a game like PeaceMaker is its audacious statement: making peace is as challenging and compelling as making war. Great leaders could break the vicious cycle by boldly asking themselves and their people: are we really taking all the right actions? Asi Burak (@aburak) is the President of Games for Change. He's an award-winning executive producer (PeaceMaker, Play the News, Half the Sky Movement), and a faculty member at the School of Visual Arts in NYC.